Why develop an advanced Subsea Rock Cutting (SRC) tool? Rock cutting production estimates are typically either based on experience or on the Specific Cutting Energy methodology. What if you don’t have any relevant experience? Would you have faith in the simplistic Specific Cutting Energy method available for rock cutting, considering that cutting hard rock always involves high capital investments and thus high stakes? The Specific Cutting Energy method only considers the horizontal cutting force on teeth. However, the teeth are typically blunt for most of their lifetime, therefore the vertical cutting force is just as important. 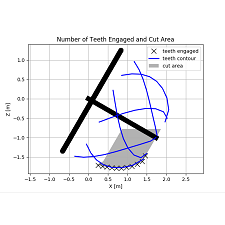 Consequently, this simplistic method cannot possibly provide a reliable estimate for the resultant cutting force. i2D’s Subsea Rock Cutting (SRC) tool takes both the horizontal and vertical cutting forces into consideration for each tooth engaged with the rock face. The forces from each of the individual teeth are summed together to provide the resultant cutting force. It is this resultant force that affects cutting production. For instance, the production of a heavy cutter suction dredge is often limited by its spud, ladder or side winch due to the resultant cutting force produced especially in hard rock. SRC can accurately estimate cutting production for any dredging or mining equipment that mechanically cuts rock in a subsea environment. Provided below are a few animations to further illustrate the capabilities of the SRC tool. Cutterhead both translates and rotates, and the teeth at the front of the Cutterhead cut less rock then the ones at the back, mainly due to the contour angle. The animation below shows this complex three-dimensional geometry. Arrows are provided in the animation to indicate the horizontal and vertical cutting forces for each tooth engaged with the rock face. The sum of these forces provides the resultant cutting force shown. Recently, drum cutters have been installed underneath dragheads (JdN) and assembled together for deep sea mining applications (Nautilus). The animation below shows the dynamics of using a drum cutter in a subsea environment. Drum cutters (Vermeer) are a proven technology onshore, but how do they perform subsea? in2Dredging’s consultants take immense pride in our advanced tools, which allow us to provide robust and reliable estimating services.